The networks that your business operates on are often open and complex. Your IT department is responsible for mitigating network risks, managing performance and auditing data to ensure functionality. Using NetFlow forensics can help your IT team maintain the competitiveness and reliability of the systems required to run your business. In IT, network security forensics involves the monitoring and analysis of your network’s traffic to gather information, obtain legal evidence and detect network intrusions. These activities help keep your company perform the following actions. NetFlow forensics helps your company maintain accountability and trace usage; these functions become increasingly difficult as your network becomes more intricate. The more systems your network relies on, the more difficult this process becomes. While your company likely has standard security measures in place, e.g. firewalls, intrusion detection systems and sniffers, they lack the capability to record all network activity. Tracking all your network activity in real-time at granular levels is critical to the success of your organization. 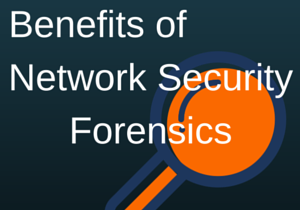 Until recently, the ability to perform this type of network forensics has been limited due to a lack of scalability. Now, there are web-based solutions that can collect and store this data to assist your IT department with this daunting task. The ability to capture all of this activity will empower your IT department to provide more thorough analysis and take faster action to resolve system issues. But, before your company can realize the full value of NetFlow forensics, your team needs to have a clear understanding of how to use this intelligence to take full advantage of these detailed investigative activities. Gathering the data through automation is a relatively simple process once the required automation tools have been implemented. Understanding how to organize these massive amounts of data into clear, concise and actionable findings is an additional skill set that must be developed within your IT team. Having a team member, whether internal or via a third-party vendor, that can aggregate your findings and create visual representations that can be understood by non-technical team members is a necessary part of NetFlow forensics. It is important to stress the necessity of visualization; this technique makes it much easier to articulate the importance of findings. In order to accurately and succinctly visualize security issues, your IT staff must have a deep understanding of the standard protocols of your network. Without this level of understanding, the ability to analyze and investigate security issues is limited, if not impossible. Utilizing a software to support the audit functions required to perform NetFlow forensics will help your company support the IT staff in the gathering and tracking of these standard protocols. Being able to identify, track and monitor the protocols in an automated manner will enhance your staff’s ability to understand and assess the impact of these protocols on network performance and security. It will also allow you to quickly assess the impact of changes driven by real-time monitoring of your network processes. Sound like a daunting task? It doesn’t have to be. Choose a partner to support your efforts and help you build the right NetFlow forensics configuration to support your business.